The Pearl's West Course is a famous Dan Maples design along the Grand Strand. Nestled amongst the Calabash River, The West Course is not recommended for the timid at heart. Several challenges demand attention and pinpoint accuracy and the overall design of the course has provided the perfect layout for many major championships since it opened in 1986. The greens are generously large but are carefully surrounded by thick pampas grass in order to stress the importance of accuracy and well-planned shots. The Pearl's West Course is a common list style course though the gameplay is anything but common. Wide open stretches of fairway compliment the natural surroundings such as the majestic tress that line the sides of the fairways and stunning arrays of challenges presented by sand bunkers and water hazards. After stepping foot on this course, it is apparent that the grounds are meticulously kept and cared for. First view of the course is always a breathtaking moment, no matter how many times and individual has been there. Five sets of tees allow players of all skill levels to enjoy The Pearl's West Course. However, for the avid golfer, several water, sand, and even oyster shell hazards keep the skilled golfer on his, or her, toes. Granted a five star rating by Golf Digest in 2004, this course keeps players coming back for more repeatedly. This prestigious course speaks volumes of its designer's skill and compliments the scenic view provided by coastal marshlands and the Calabash River. The untouched, untamed natural beauty that surrounds the course adds to the pleasure of the game. 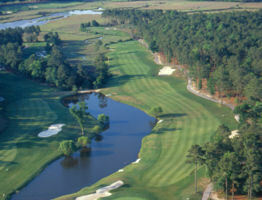 The Pearl's West Course is a famous Dan Maples design along the Grand Strand.